If you ever need something, anything, fixed, Donatello is the only Turtle you'll ever need to call. He has the ability to know how things work - probably because he's been taking things apart and putting them back together since he was young. Sure, Donatello likes to act calm and collected, but he can't help himself when it comes to cool technology - he totally flips. When he's not inventing awesome new vehicles like the Battle Shell or turbo-charged Sewer Slider, Donatello loves to use his lightning-fast Bo staff. Leonardo's sense of responsibility has made him the unofficial leader of the team, but don't tell that to the other Turtles. While Leo enjoys a good rumble as much as the next Turtle, he's drawn more to the spiritual side of martial arts. This dedicated pursuit has created a special bond between Leonardo and his sensei, Splinter. Quick with a joke and even quicker with the nunchaku, Michelangelo's Ninjitsu style is no laughing matter. Always the jokester of the group, he loves to be the center of attention and his great sense of humor has made him the team's peacemaker. Sometimes his overactive imagination helps when the pressure's on and the gang needs some quick thinking. 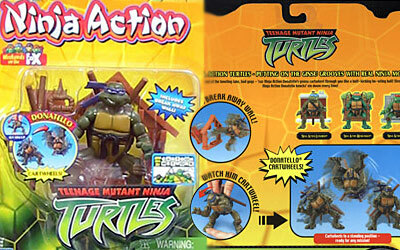 Splinter decided that the nunchaku is the best choice for Mikey-T's flashy style and excitable personality. Raphael has mastered the sai, but has a temper. Raphael is the most fearless on the team. He'll leap in no matter what the odds.